A light weight compound for fairing surfaces of fiberglass, metal, wood, foam, masonry, and most plastics. 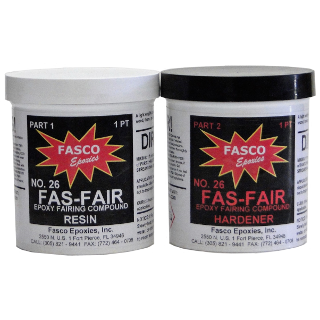 Mixing: Mix equal parts of Resin Part 1 with Part 2 Hardener. Mix very thoroughly until there are no streaks. Pot Life of 25 minutes at 76 degrees. Larger amounts and higher temperatures shorten pot life, and vise versa. Surface should be clean, dry, and sanded before use.